. Mandala 曼荼羅 and Fudo Myo-O . "He is shown as a plump boy of vulgar appearance and with an angry face. The color of his body is red or yellow or black or blue. His hair is arranged in seven knots, these denote the seven kinds of illusions, and one knot hanging down is to represent his loving kindness for sentient beings. His face wears an angry expression and he shows his tusk-like teeth. 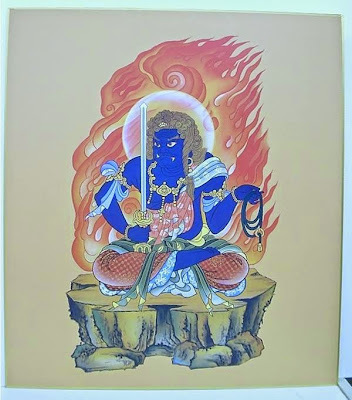 He sits upon a stone that represents his immovability and ability to conquer evil, around him are flames which signify the burning up of all the illusions of sentient beings. An eight-petalled lotus grows from the top of his head." A version of the *Taizoukai mandara 胎蔵界曼荼羅 that is widely used today in Japan. The original version, brought to Japan from China by *Kuukai 空海 (774-835), was kept at Touji 東寺 (Kyoto), but because it began to show signs of wear in Kuukai's later years, a copy was made in 821 (Kounin 弘仁 12), this first copy is known as the Kounin version. 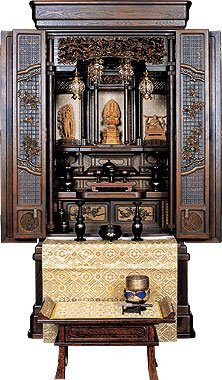 The version presently used at Touji is the fourth copy, made in the Genroku 元禄 era (late 17c), and is known as the Genroku version. In addition, three mandala *mandara 曼荼羅, fragments were discovered in 1954 in the attic of the treasure house Houzou 宝蔵 at Touji, and of these the so-called kouhon 甲本 (version A) is thought to be a fragment of the second copy of the Genzu mandara, made in 1191, while the so-called Einin 永仁 version is thought to be a fragment of the third copy, made in 1296 (Einin 4). The Genzu mandara is considered to have been brought to completion by Kuukai's teacher, Huiguo (Jp: Keika 恵果, 746-805), and it represents the final form of the Taizoukai mandara, which evolved from the mandala of the DAINICHIKYOU 大日経 (Sk:Vairocanabhisambodhi-sutra via the *Taizou zuzou 胎蔵図像 and *Taizou kyuuzuyou 胎蔵旧図様. Its composition varies somewhat, but it consists of approximately 400 deities systematically arranged in 12 sections called Chuudai hachiyouin 中台八葉院, Henchi-in 遍知院, Jimyouin 持明院, Rengebu-in 蓮華部院, Kongoushu-in 金剛手院, Shaka-in 釈迦院, Kokuuzouin 虚空蔵院, Monju-in 文殊院, Soshitsuji-in / Soshitchi-in 蘇悉地院, Jizouin 地蔵院, Jogaishouin 除蓋障院 and Gekongoubu-in 外金剛部院. 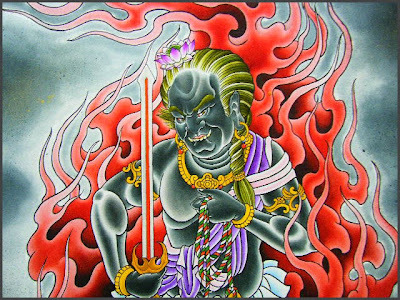 Compared with the approximately 120 deities mentioned in the DAINICHI-KYOU this represents a more than threefold increase in the number of deities. The term genzu 現図 (current depiction) was first used by Godai-in Annen 五大院安然 (841-889/898?) of the Tendai 天台 sect. 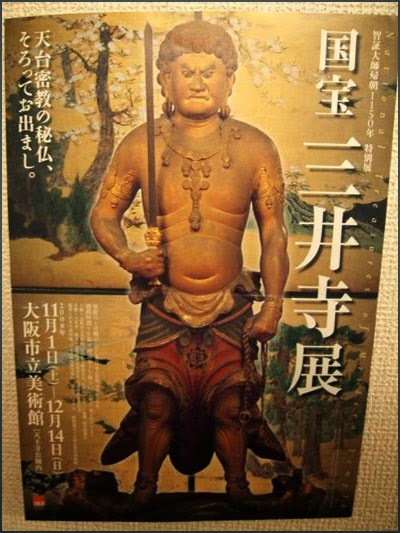 Later, in his SHOSETSU FUDOUKI 諸説不同記 a detailed comparison of the iconography of the deities depicted in the Taizoukai mandara, the imperial prince and Buddhist priest Shinjaku 真寂 (886-927) used the term to designate the orthodox Taizoukai mandara as transmitted by Kuukai in contradistinction to that brought to Japan by Shuuei 宗叡 (809-884) and that preserved in the Tendai sect, and it subsequently passed into general usage. The term genzu should therefore be used to refer to the current depiction of the Taizoukai mandara. There are, however, some art historians who use the term Genzu Kongoukai mandara 現図金剛界曼荼羅 to refer to the current depiction of the *Kongoukai mandara 金剛界曼荼羅, viz. *Kue mandara 九会曼荼羅, but this usage is inappropriate. To date examples of the Taizoukai mandara that have been discovered are slightly different than the Shouei versions and Tendai version alluded to by Shinjaku, but the differences between these versions and the Genzu mandara are not as marked as those between the Genzu mandara and the Taizou zuzou and Taizou kyuuzuyou and they may therefore be regarded as variants of the Genzu mandara in a broad sense?. The mandalas or psycho—cosmograms reached Japan through great Indian teachers like Vajrahodhi, Amohavajra and Subhakara.. The Japanese Twin Mandalas represent innate Reason and primal Enlightenment. harmonising in Compassion and Dynamis. Herein the sadhaka identifies himself with the forces that govern the universe, and collects their thaumaturgical powers within himself. The Light that burns within spreads out and is diffused, guiding towards noble paths. 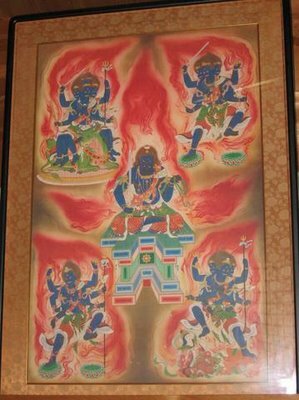 As pointed out above, the iconography pertains to the Twin Mandalas of the Mahakaruna— garbha—mandala and the Vajradhatu-mandala, which were taken to Japan by Kobo Daishi 774-835) from China, where he had gone in search of the Transcendental Path of Mantrayãna. Kobo Daishi inherited the Tantric tradition of Amoghavajra (705—774) “the Master of Eloquence and Wide Wisdom”, whose genius was responsible for the translation of the Vajradhan texts on the contemplative system of Esoteric Yoga, which was visualised in the iconics of the present mandalas.Kobo Daishi was initiated by Hui-kuo (746-805) who was a direct disciple of Amoghavajra. 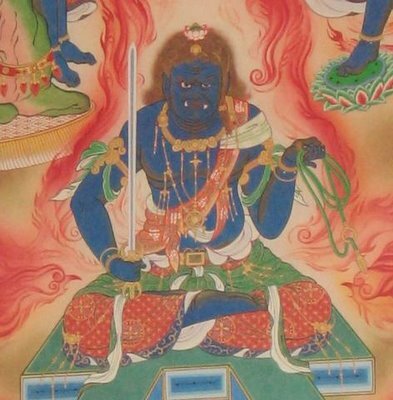 In 806 Kobo Daishi returned to Japan, with profound Gods born unto him, with homa consuming baser passions, his total being illumined by a new vision. While Kobo Daishi carried the sutras expounding the Vajradhatu, he also took along with his Pictorial representation in the form of two mandalas. 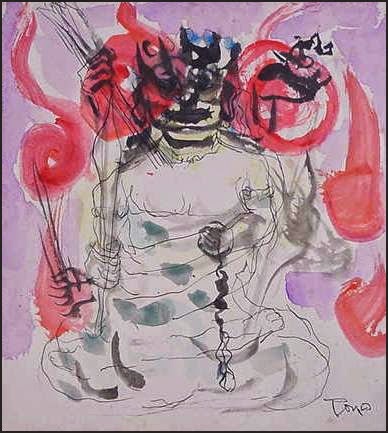 Hui-kuo had them drawn, for the sake of Kobo Daishi, in accordance with the Tattva-samgraha, by the famous painter Li-chên assisted by more than ten other artists. These Twin Mandalas found their efflorescence and fruition in Japan. The mandalas brought by Kobo Daishi are now lost, but from them were painted the Takao Mandalas in AD 824 in gold and silver lines on purple damask silk in polychrome. The present woodkut version goes back to the Takao Twin Mandalas through Ken-i’s monochrome copy drawn in AD 1035 on the 200th anniversary of the nirvana of Kobo Daishi. 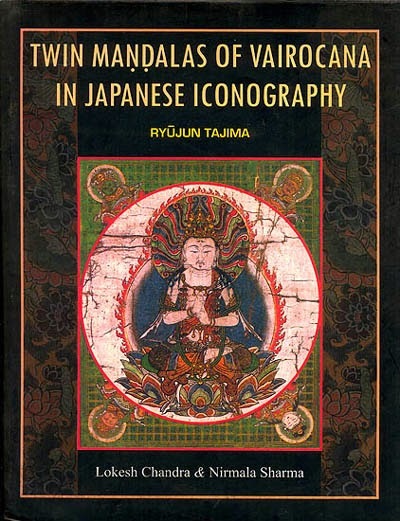 A fundamental work for the philosophic and artistic understanding of the theory and graphic representation of the mandalas in general and especially in the Shingon tradition of Japan. Details the philosophy, patriarchs and sacred canon of Mantrayana. its ulterior development into two branches in Japan, the nature and different kinds of mandalas, as well as their classification and essential principles. The twin mandalas of Vairocana based on the Mahãvai rocana-sutra and the Sarvatathãgata-tattva-sangraha are detailed in all aspects: their basic ideas, their interrelationship and differences in character, their configuration and symbolism. The iconography of all the deities is given at length from the root text, from the Hizoki of Kobo Daishi, and from the graphic representation which is the prime theme of the work. The work ends with the doctrine of Shingon (Mantrayana), its differences from exoteric or “popular” Buddhism, the three universals, the triple mystery, the four kinds of dharmakãyas, the stupa of five circles, the five knowledges, the three degrees of Tantric abhiseka (empowerment), bodhicitta and so on. It is a sine qua non for the comprehension of the history, iconography and aesthetics of niandalas with their inexhaustible Olympus of divine beings symbolising the mystic experience in the plenitude of ecstasis. The nine submandalas of the Vajradhãtu-mandala were put together by Hui-kuo to correspond to the imperial city of Ch’ang-an. Nine has played a crucial role in Chinese perceptions: the Imperial Palace had nine halls, the celestial sphere has nine divisions, both in Buddhism and Taoism, heaven is ‘nine enclosures’ (chiu ch’ung). The Imperial metropolis was sanctified by this novenarian mandala. It represents the six mandalas of the first section of the Sarva-tathagata-tattvasamgraha (STTS, nos.1-6), two mandalas of its second section of ferocious divinities (nos.8, 9), with the naya-mandala (no.7) of the anuttara-yoga tantras in between. The first six mandalas pertain to two kramas: (i) utpanna-krama and (ii) sampanna-krama. 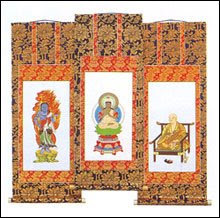 2. dhãrani-mandala of consorts (represented in the Sino-Japanese graphic representation as symbols, because the Chinese emperor could not worship goddesses). 3. karma-mandala, same as no.1, but the divinities are metallic for ritual (karma) unctions. 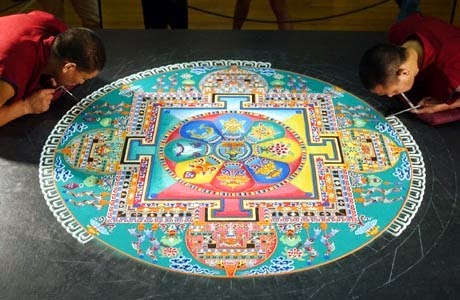 The pair of the mandala was made by Hui-kuo, the seventh patriarch of Esoteric Buddhism. Kobo Daishi inherited it from him and designated them Genzu mandala or prevalent version, as contradistinguished from the other versions transmitted by the ãcãryas i.e. 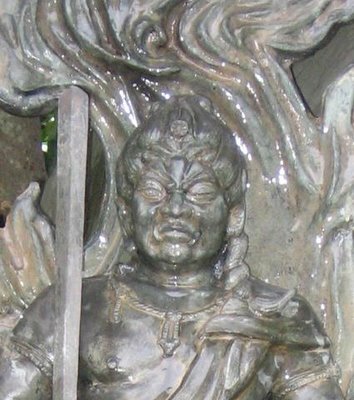 Subhãkarasithha and Amoghavajra. The colored illustrations are reproduced in this volume from the two hanging silk scrolls of the Muromachi period (1336-1568) preserved at the Kongobu-ji monastery, Koyasan. 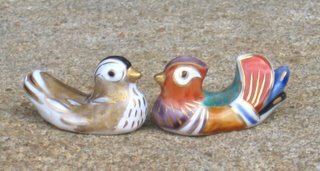 Both are 204.4x159.Scm in size, magnificent in the sunyata of their subdued colors of contemplative silence. Dr. Tajima has used the woodcut version of the Chokoku-ji (Hase-dera) monastery in Nara, the grand monastery of the Busan school, engraved by Hasegawa Toshuku in 1834, at the request of devoted monks and pious donors. The woodcut mandalas measure 1.63 x 1.36cm. They are based on a copy from the crypt of the school of the monastery (kangaku-in); whose period could not be ascertained. The original master who inspired this project was the Vinaya-ãcãrya Bankei of the Jiko-ji monastery, but he regretted that he had neither the resources nor the youth to accomplish it. He left it to his disciples with the hope that nothing will give him greater joy than the accomplishment of the design of the Two Mandalas for the conservation of Dharma. Acarya Bankei has the glorious fortune to know that his disciples carried it out, a hundred years thereafter Venerable Ryujun Tajima wrote on it in French so that the Dharrna is known to the Western world, and now we have translated it into English so that it becomes a global heritage. These mandalas are external signs of the mystery behind Being as well as the path leading to it. They are the traditional symbols to attune the mind to divine worlds by the inner experience of contemplation. Mandala in the Atharvaveda Pratisakhya, Mahãbharata, Manu and Yajnyavalkya is a province, country, a neighbouring state with whom a king has to maintain political and diplomatic relations. From the political context it became the symbolic space of contemplation with inextricable complexity of philosophic depth, the insatiable embodiment of enlightened meditation to lift the veil of cosmical consciousness in the placid and threatening iconism of the divinities. Here are the sparkling mind waves of the Twin Mandalas of Mahãvairocana ‘The Great Sun’ in the graphic and philosophic formulations of the Sino-Japanese tradition. Just as the Sun Vairocana fecunds the earth from his remote majesty, likewise “inspite of passions in this world, Bodhi is not far off, the paradise is well nigh”. 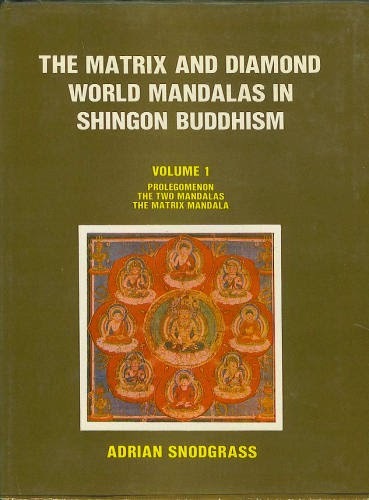 The Matrix and Diamond World Mandalas in Singon Buddhism surveys and re-interprets the vast work of traditional and modern Japanese scholarship on the twin Mandalas. Adrian Snodgrass of the University of Sydney (Australia) has spent several years of detail the iconography of each and every deity of these two Mandalas as well as to bring out their traditional symbolism that reflects the Tantric thought in its earliest phases. Tantrism or Mantrayana reached China and Japan earlier than it did in Tibet. 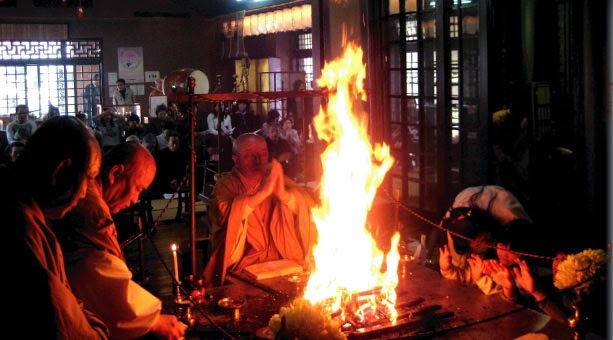 Hence the great importance of Shingon, as Japanese Matrayana is known, for the history of Tantras and the earlier foundations of this philosophical system that blossomed into the overflow of art in Japan and Tibet, where it flourishes to this day. The book presents the theories and practices connected with the two Mandalas as followed by the Shingon Sadhakas. It translates and paraphrases materials from three primary and three secondary sources: the Mahavairocana-sutra (Dainichikyo), the Vajra-Sekhara-Sutra (Kongochokyo), Subhakarasimha's (Zemmui's) Dainichikyosho ("Commentary on the Mahavairocana-sutra"), the Mikkyo-daijiten ("A Dictionary of Esoteric Buddhism"), the Bukkyo-daijiten ("A Dictionary of Buddhism") and Toganoo Shoun's Mandara no Kenkyu ("Studies in the Mandala"). 12. The laying out of the Matrix Mandala. 13. The Subhakarasimha and Amoghavajra interpretations of the Matrix Mandala. 14. The Genzu Matrix Mandala. 15. 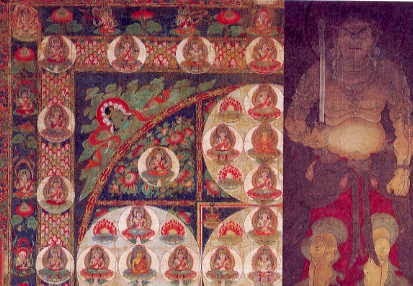 The layers of the Mandala and the Buddha bodies. 16. The layers of the Mandala and the stages to awakening. 17. The three sections of the Matrix Mandala. 18. The central Dais Eight-Petal mansion. 19. The five Buddhas and the four Bodhisattvas of the central mansion. 20. The universal knowledge mansion. 21. The mansion of the Mantra holders. 30. The mansion of the external Vajra section. 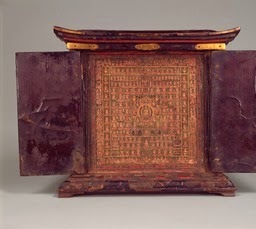 This board-painting-type Ryokai (Two Worlds) Mandala is enshrined in a small elegant shrine-like container called a Zushi, which has similar double doors on the front and the back so that the mandalas can be appreciated from either side. The painting is done on a white pigment-applied cloth pasted on a cypress board and features elaborate details in each small section. 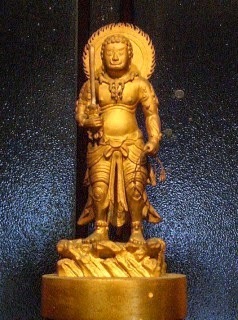 The design follows that of the Genzu Mandala brought into Japan by Kukai. However, the Taizo-kai (Womb World) mandala differs from that of Genzu Mandala in that the Kokuzo-in is divided into upper and lower parts and the Senju Kannon and Kongozao Bodhisattva representations are relatively small in the upper part. 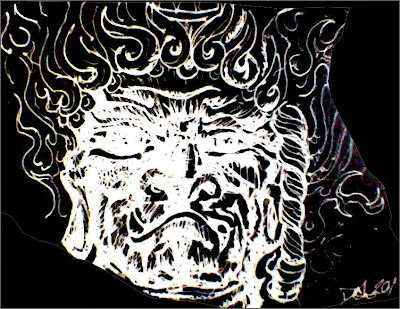 This Ryokai Mandala excels in decoration, such as the use of kirikane (a technique to cut gold/silver leaf into strips or different shapes and paste it on designs) lines in dividing lines, halos, the clothing lines of the primary deity and the complicated ground patterns in the Taizo-kai mandala and in the mesh-like patterns surrounding the Shiinkai in the Kongo-kai (Diamond World) mandala. 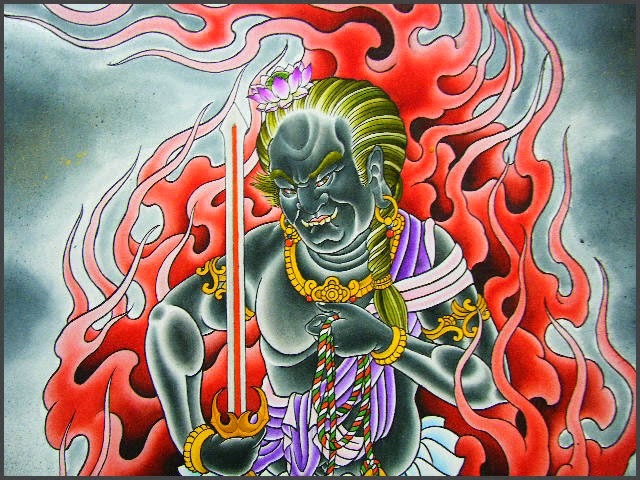 The deities are painted in flesh color with shades of red and drawn with thin sumi lines. The clothes are painted in vermilion, red or aerugo, while the clothing lines are drawn in black. The petals of the lotus pedestal are painted in vermilion and red and outlined in white. The child-like facial expressions on the deities, the bright high-quality pigments and the beauty of the intricate kirikane patterns and the coloring all contribute to convey the atmosphere of the late Heian period. The year of creation must be after the early Kamakura period. The black lacquered small Zushi was created during the same period and represents the traditions of the late Heian period. This Manadala was originally owned by Shojuraigoji Temple.
. Mandala Therapy - Introduction .
. Mandala of all kinds . A lot of paintings are found in museums in Japan and outside Japan. Others are from friends of the facebook group.
. CLICK for more samples of this BLOG . 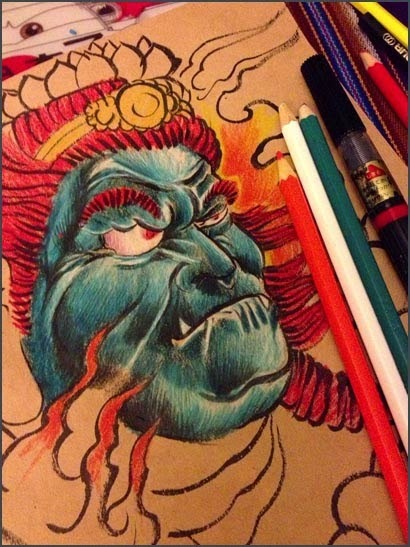 Praise to the Golden Fudo !
. Chishoo Daishi 智證大師 Enchin - Enchin 圓珍 / 円珍 . 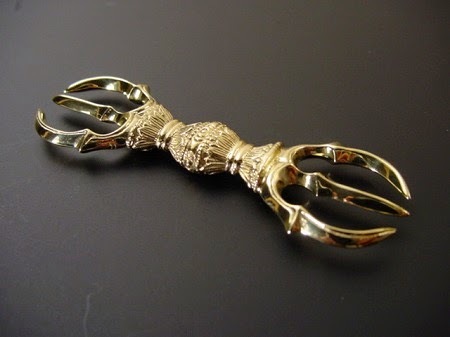 This Fudo helps to bring your wish about a good future to become true. special "Fudo Rice Gruel" 不動粥 Fudogayu is offered to the participants. The rice is offered to the statue since the evening of the 21st and then used to prepare the gruel on the 28th. On the 28th of January special rituals are held to pray for the health of the imperial family and the wellbeing of the Japanese Nation. 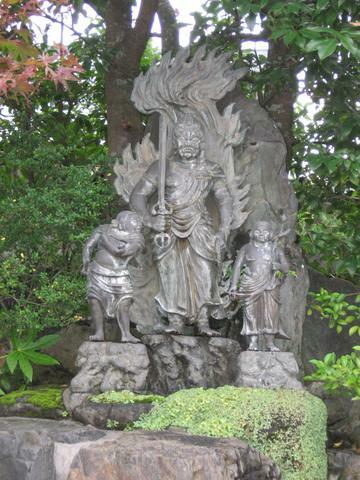 Enman-in temple (圓満院) in Otsu went on the auction block held by the Otsu District Court. It went to the highest bidder for 1.07 billion yen on May 26, 2009. The winning bidder is a religious group in Koka, Shiga. What makes this highly unusual is that the temple includes a Japanese garden and Shinden hall designated as Important Cultural Properties. The temple was established in the 12th century. The Shinden hall was moved from the Kyoto Imperial Palace in 1647. The temple has had major financial problems with its cemetery business. 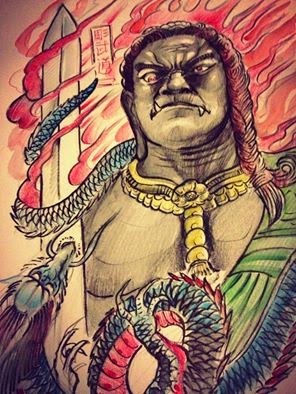 Fudo Myo-O Junrei - Introduction . .
. Rice gruel (kayu粥) and Rituals .
. Miidera 三井寺（園城寺)　Mii-dera . konjiki fudoo cha 金色不動茶 "Tea of Golden Fudo"
Sankoji 三鈷寺 Sanko-Ji "temple of the three-pronged vajra"
The temple houses a 金色不動尊 konjiki Fudo son made from wood.
. Ki Fudoo Myoo-Oo 黄不動明王 Ki Fudo-Myo-o, Yellow Fudo . 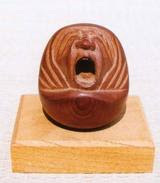 Invoking the esoteric Buddhist deity Fudō for rebirth is a lesser known aspect in the development of Pure Land worship. 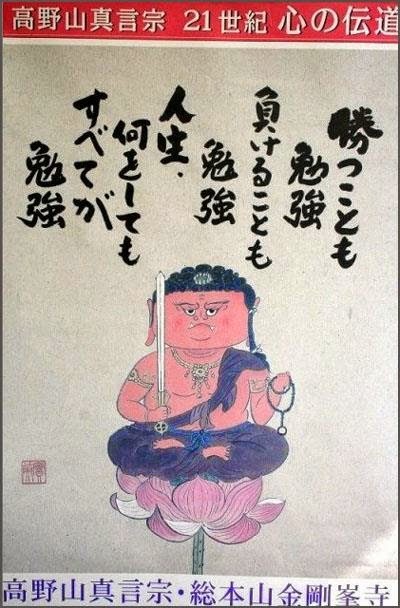 Fudō was invoked by reciting his incantation as a deathbed practice to attain proper mindfulness at death allowing rebirth into the Pure Land, particularly Miroku's Heaven, from the late Heian into the Kamakura period. The association of Fudō and Miroku's Heaven extends back to the Tendai monk Sōō (ninth century), and invoking Fudō for rebirth was practiced by such notables as Emperor Shirakawa and the Kegon monk Myōe. 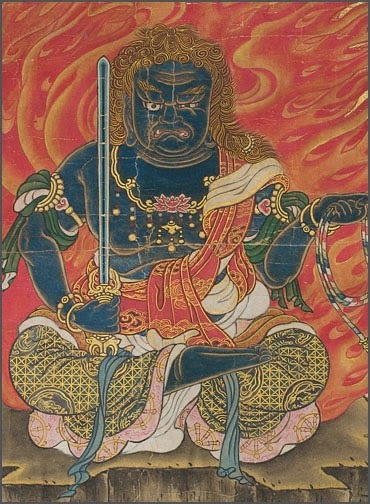 Fudō was incorporated into Miroku Raigō paintings from the end of the twelfth century into the fourteenth century, probably as a last recourse by the traditional schools of Buddhism to the rising popularity of Amida worship and easy access to Amida's Pure Land through the nenbutsu. 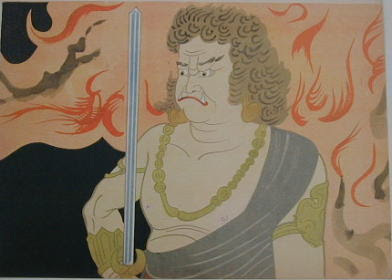 Fudō appears in Miroku Raigō paintings because he was associated with rebirth in Miroku's Tosotsu heaven since the time of Sōō. With the proliferation of accounts of invoking Fudō for rebirth in Miroku's Heaven, the association of Fudō and Miroku's Heaven grew ever closer. 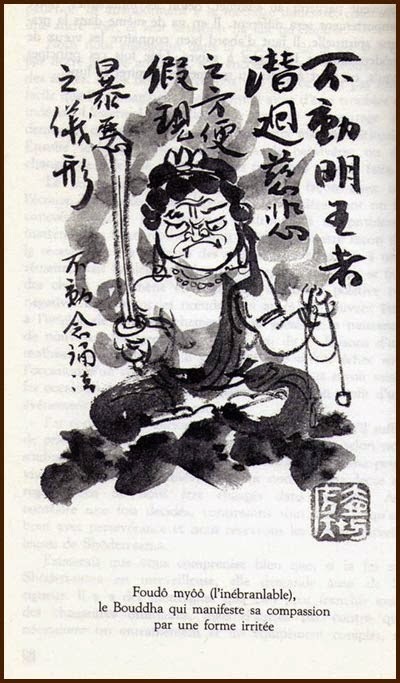 Fudō's efficacy in attaining rebirth in Miroku's Heaven was to eliminate the hindrances to rebirth and provide the prerequisites. The doctrinal source for this efficacy is found in the Hachimei darani kyō. This efficacy was important in Japan because of a widespread belief from the tenth century, not specific to any particular religious school, that maintaining proper mindfulness at the moment of death was crucial for successful rebirth. The eclecticism of these beliefs is evidenced by the Miroku Raigō itself. The incorporation of Fudō and the Katsuragawa waterfall that is said to lead straight to Miroku's Heaven attest to the influence of the Tendai school and ascetic practices 314 Japanese Journal of Religious Studies 33/2 (2006) originated by Sōō. The incorporation of Kūkai attests to Shingon belief in Kūkai waiting in eternal samādhi on Mt. Koya for the descent of Miroku. 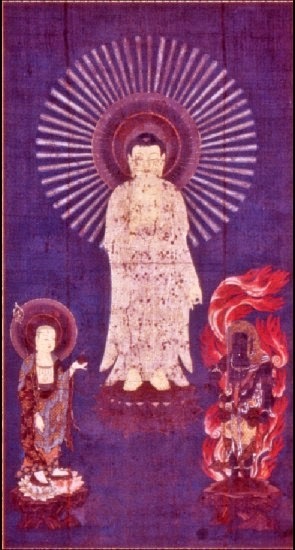 The stylistic iconography of the Miroku Raigō painting with the two foreground bodhisattvas holding a lotus and canopy attest to influence from paintings of Amida Raigō of approximately the same time, such as the fourteenth-century Amida and Fifteen Bodhisattvas Raigō owned by the Chion'in. 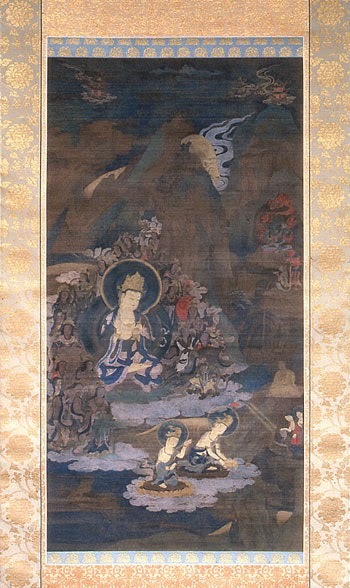 The very origin of the Miroku Raigō painting ascribed to the Nara priest Jōgen attests to the esoteric influence within the Nara schools of Buddhism. These Miroku Raigō paintings, which were generated at the end of the twelfth century and continued to be painted into the fourteenth century, were probably produced within the traditional schools of Buddhism as a last recourse to the rising popularity of the new Kamakura schools promoting Amida worship and easy access to Amida's Pure Land, which soon eclipsed the older schools in popularity. 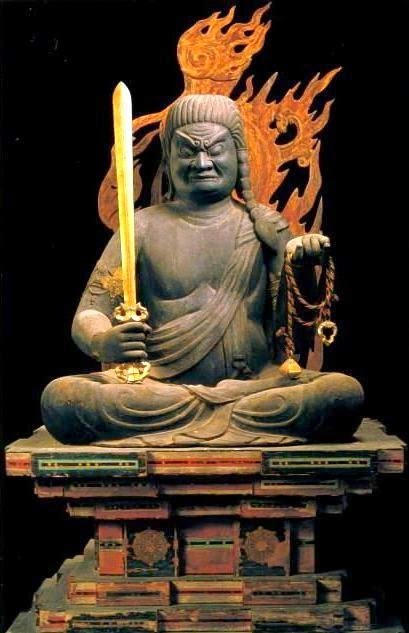 By relying on the nenbutsu to attain rebirth in the Pure Land, one no longer needed Fudō's mantra to eliminate the hindrances to rebirth and this practice of intoning Fudō's mantra for proper mindfulness at the moment of death fell out of use.
. Miroku Bosatsu 弥勒菩薩 .
. Myoe Shonin 明恵上人 . 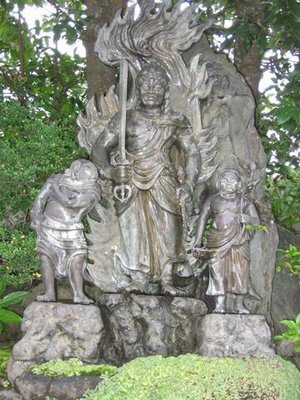 The main statue here is Fudo Myo-O. The temple was founded in the late Heian period. In the Edo period it became the Regional headquarter 中本山 of the Daigo-Ha 醍醐派.
. . . hope and salvation is the underlying message of Tendai, and one recurring painted image is that of the enlightened Amida Raigo swooping down on a cloud, surrounded by attendant deities -- sometimes accompanied by a heavenly orchestra -- to pluck a deserving soul from Earth "in the blink of an eye."
. 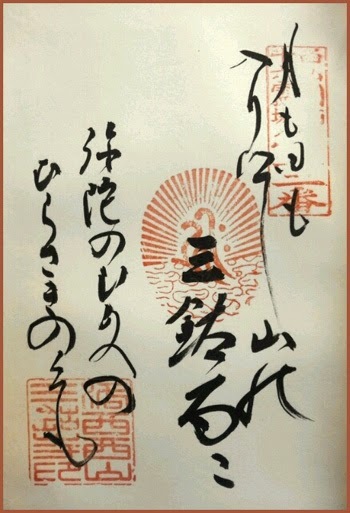 Saicho, Dengyo Daishi 伝教大師最澄 .
. Amida Raigo zu 阿弥陀来迎図 .